I spoke at grandma's funeral, hoping to honor her with a tribute that was fitting. Many have asked for copies of my eulogy so I thought it may be easiest to type it here, where I will also be able to come back and read it in the coming days. I am so thankful for the hope of Heaven and praise God for His mercy in my grandma's death. It was beautiful and peaceful and she was in no pain. That leaves me with great peace! I want to thank you all for coming and showing your love, kindness, and sympathy on behalf of my grandma and all of us. In the last few days I said to her many times, "Grandma, you are loved by so many people," and each time she replied, "I know it Ramee and that's a really good feeling." I wanted to take a few minutes to share with you the things that I will forever cherish about my grandma Donna. Some of my earliest memories are of sitting around a kitchen table in my grandparent's log cabin. I spent much time across from my petite grandma, as her tiny feet, not touching the floor, would swing beneath her. We would write together. Now my great passion and my greatest accomplishment-I'm certain it began with hundreds of hand written pages there in her kitchen. She was always so proud of that. We would write our signatures, practice our cursive (I loved her handwriting so I would watch her intently), and we signed our names to dozens of cards. Come to think of it, I probably learned the timeless gift of card giving from her as well. She was deeply empathetic and I vividly recall her sending cards to families who had recently suffered a loss. She understood the pain of that, after all. I always admired that of my grandma. She had endured the devastating loss of her baby boy-her Stanly, and yet, she seemed strong. She missed him deeply and even as a young girl I felt so lucky that she would talk to me about him and how she ached for him. We spent so many hours through the years sharing photos and learning about the details of the uncle I never had the privilege to know. My grandma was never afraid to tap into those deep emotions although it must have been so very difficult. Looking back, I always admired that she had suffered and yet went on to really live. 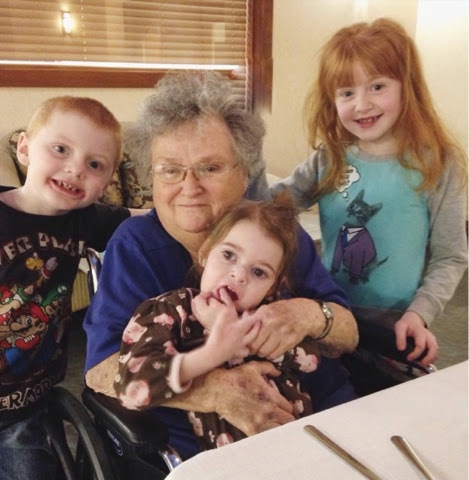 She had deep friendships, pursued hobbies, hosted holiday after holiday after holiday, fostered a marriage, traveled, ate good food, enjoyed good coffee, worked a full time job, played UNO with grandchildren, often, sewed Halloween costumes, and gave of herself to many neighbors, friends and loved ones along the way. In sharing with me about the uncle I never knew, she gave me the gift of knowing who he was. But in living her life with poise, strength and dignity in the years that followed0she gave me the ultimate gift in truly knowing who SHE was. Her character and determination were rooted in hope, charity and family. 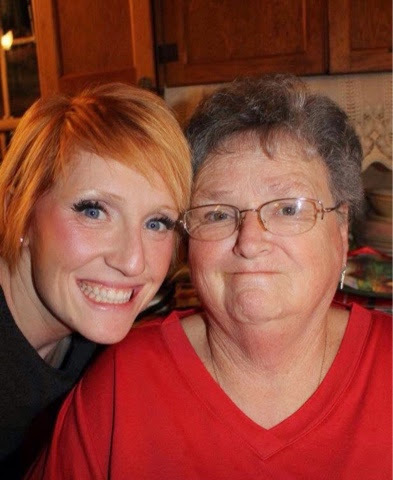 And as a grown woman who was once an ornery, loud, stubborn little redheaded girl stands before you, I can truly say that if my grandma could live such a vibrant, full life after such a heartbreaking tragedy, I'm confident that I can too. She has given me great unspoken wisdom. All I had to do was sit back and watch the way she lived-and it was a gift. But, it wasn't all unspoken. I'm certain that so much of my fiery attitude, wont-back-down personality and great big (for such a little girl) confidence is due, in great part, to her. If you knew her, you probably knew her opinion She was an open book and I loved that about her. I'm sure so many of you share in the many of my wonderful memories because my grandma opened her home and her heart to everyone. Family and community were so crucial to who she was. There isn't a time in my life that I can remember the door to my grandma's home not being open. She had a unique way of making everyone feel like family. She not only opened her heart, but also her ears, her hands and her life to all. This is another trait I feel proud to have inherited and can only pray that I would continue to carry on in her memory. Through the years there have been family reunions, Christmas parties, Thanksgiving feasts, Halloween popcorn balls, and the biggest annual Easter egg hunt ever. There were October wiener roasts, birthday celebrations, red velvet cakes, homemade noodles and homemade blankets. There were board games and bust trips, red convertible rides and for us grandchildren0rides in the back of a big, old van to see the Christmas lights year after year. A pot of coffee always on, a phone call always answered, faithful dairy queen social sessions and her little laugh that always felt like home to me. Even on her last day, she laughed up at Mabel as we greeted her for the morning. She sewed many homecoming dresses, baked many cakes and big cookies, displayed proudly every photograph and showed up to every single ballgame or event I ever participated in. In fact, she wouldn't have missed it to save her own life and as a grandchild that was the best feeling. She was faithful, loyal and steadfast...in every area as long as I can remember. In the last year I watched my grandma fight to try and get better. She loved us all so much and I know she wanted us to always know she gave it all she had. She was a little fighter-always. Loud, opinionated and ambitious and she never backed down-not to anyone...even my grandpa. She always gave him a run for his money! But she loved that man. And in this year as he cared for her every day, I know she wouldn't have wanted it any other way. She trusted him and I watched humbly as she looked up at him with thankfulness and reassurance that it was all going to be ok. She appreciated how you loved her, grandpa and she wouldn't want you to remember, because she was a woman of great faith, that only God directs our path. And as you took care of her at the tail-end of her life journey you were part of an extraordinary thing-you helped usher her into Heaven peacefully. With Jesus and with her baby. I know she's thankful! You were loved so much! You were her boys! She would laugh and speak of your mischief but she would defend you and stand up for you always. She adored being your mom and she was always looking forward to time with you. I know she was grateful for the times that she was able to share with you after hunting, a motorcycle ride of Sunday morning breakfast. You were her life's purpose and ultimate joy. To my sister with grandma's eyes-remember when you put on your make-up where that green/brown color came from. It's beautiful. To my brother, the baby, you were grandma's boy! There's not much to say about it because your bond went far beyond words. She loved you like no other. Grandma was so proud of you! Of your family, and your job. She loved you uniquely. She was always telling me how cute you were as a little boy, much like your Aiden. You were so lucky to know your great-grandma! So many children don't get the chance but it was a special gift! She loved and cherished each one of you oh so much! You were her joy and she was always so proud of you. Never forget that. I know that goodbye is not easy. I know how heavy and hard and sad it feels But I also know my grandma Donna. I know she would want us to remember her, celebrate her and then I know she would want us to move along-enjoying all this beautiful life has to offer, resting in the hope that we will see her again one day in Heaven-our true home. Before I close I wanted to read a verse that was sent to me this morning by a dear friend. "The Lord himself goes before you and will be with you He will never leave you or forsake you; do not be discouraged." Again, thank you for coming and wrapping our family in love and for the awesome reminder of how cherished my grandma truly was! Last night Nora told me how beautiful grandma looked at her visitation, like she was made for Heaven. She is oh so right!